MOSCOW. July 24 (Interfax) – Moscow is ready to start work to bring closer the viewpoints of Malaysia and Russia in regard to the investigation of the Malaysian Boeing 777 crash in Ukraine, Russian Ambassador to Malaysia Valery Yermolov said. The text of the ambassador’s speech on the Boeing 777 tragedy and situation concerning the attempts to form an international tribunal for this regard was obtained by Interfax on Friday. “We are ready to start work to bring closer the different approaches of Malaysia and Russia [on the Boeing situation] with complete understanding, realization of the huge responsibility and respect for the relatives of the deceased,” Yermolov said. Preventing a split in the UN Security Council over the resolution on the Boeing catastrophe is very important, the ambassador said. “Russia believes that it is necessary to prevent a split showing in the UN Security Council,” he said. The attempts to form an international tribunal over the Boeing crash in Ukraine are premature, Yermolov said. “We consider the issue of forming an international tribunal over the Boeing MH17 catastrophe to be premature and counterproductive. We are convinced that the resolution of the UN Security Council 2166 remains the only acceptable basis for international cooperation and in the interest of an independent and transparent investigation into the reasons behind the Malaysian plane crash,” the ambassador said. “But we do not see that this process is taking place right now,” the ambassador said. It is regrettable that regardless of the 2166 resolution, the UN secretary general has not submitted to the Security Council a variant to support the ongoing investigation, Yermolov said. At the same time, forming an international tribunal on the Boeing crash is unprecedented because nothing like this has occurred in international practice, the ambassador said having listed a number of major plane crashes, including the crash of Russia’s Siberia plane in 2001, which was shot down above the Black Sea by Ukrainian armed forces and the tragedy of the passenger plane flying from Iran above the Persian Gulf on July 3, 1988 which was shot down by a rocket from a U.S. ship. “No international tribunals were formed up until now in similar situations when investigating plane crashes,” Yermolov said. At the same time, the ambassador said he offered his condolences to the relatives of all the people killed in this tragedy. 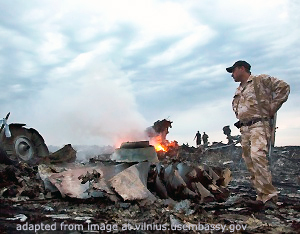 The Malaysian Airlines Boeing 777 MH17, en route from Amsterdam to Kuala-Lumpur, crashed in east of Ukraine’s Donetsk region, the armed resistance zone, on July 17, 2014. The jet had 298 people on board – 283 passengers and 15 crew members – they all died. Supposedly, the plane crashed as a result of a rocket assault, however official conclusions from the international committee investigating the reasons behind the tragedy have not been released yet. A number of countries have composed a UN Security Council draft resolution seeking the formation of an international tribunal to investigate the reasons for the plane crash, which claimed 298 lives.